When I first started sewing knits last summer, I found this fabric that I thought would make a very trendy, awesome top that I would wear forever. I loved the challenge of working with stripes and I thought the colors, pink and orange were fantastic. It reminded me of a creamsicle. I realize that would be orange and white, but it's my blog and I get to make things up if I so choose. I wanted it in long sleeve, but I didn't have enough fabric. Ok, let's be honest, whether I had enough fabric or not, I did one of my signature moves and would have screwed it up anyway. I cut the top of the sleeve off the pattern because I thought it was just for the short sleeve and ALMOST cut the fabric too. I figured it out just in time and that was when I realized that I didn't have enough fabric to do the long sleeves the right way! I was kind of sad because I thought it would be my go to top for the fall, probably every Friday. During the school year, I get into the habit of wearing the same "uniform" every Friday. This would be great until it got really cold. Alas, short sleeves it was. I thought I had done a fabulous job, even using a double needle for the top stitching, but the neckline has the most annoying little wave in the middle. To the untrained eye, it would probably pass as completely unnoticable, but to my over trained eye, it's unacceptable. I couldn't be bothered ripping out the neckline, so I gave it to good will and decided to carry on with my life. Without a creamsicle shirt to wear on Fridays. And since I had a little fabric left over, I put a little skirt on a onesie for this little peanut. Fast forward to a month ago or so. I found a remnant of the very same fabric and I couldn't help but buy it! I figured if I combined it with what I had left over from my first attempt, I could finally make the long sleeved version I was so excited about. Since it was a remnant, I knew it was less than a yard but I was pretty sure it would be enough. I was so very sad to discover that I didn't actually have anything but a few scraps left. However, I laid out the fabric and the pattern and tried it several ways and determined it would juuuuuuust barely fit. So, I cut out the sleeves (long sleeves!) And I cut out the back. And even though I had already checked it all out, I didn't have enough fabric to cut the front. In a shocking twist of fate, this week, I found my original shirt. I hadn't sent it off to good will. I packed it away for the spring, to deal with it in warmer weather. And then I had a BRILLIANT idea. Since I'm not happy with that wavy neckline or the short sleeves, I could rip out the neckline, take off the front and use it for the new one I'm cutting. And do the neckline correctly on the long sleeve version. But, will it really all match up? Is it worth it? 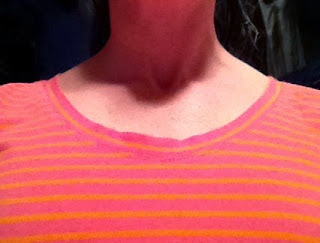 Can I get away with a slightly loose neckline? And really, what am I going to do with 2 sleeves and a back cut out of the fabric I have? What a very clever idea of putting a skirt on a onesie. II wish I had thought of that Idea when my little girls were younger. Thank you for sharing with the Clever Chicks Blog Hop! I hope you’ll join us again next week!